She was over 30 years old when we bought her. 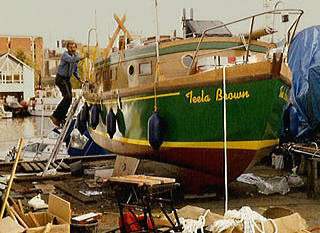 Teela Brown, aka Boat of the Boat, People and Me series of books, had become, by then, a renovation project. 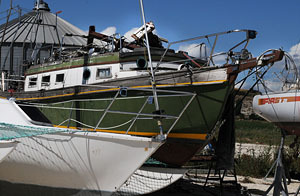 As is the way with wooden boats parts of her were in perfect condition and parts a disaster. I applied much ergonomic re-think to the restoration all of which worked out fine. 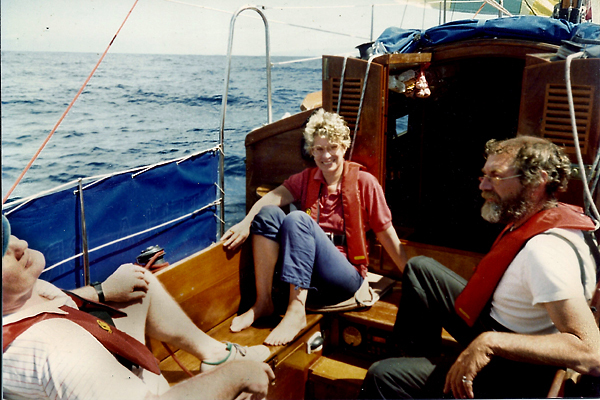 We lived on Boat for 15 years and covered some 50,000 nautical miles. But for all the work we did on her Boat was someone else’s design. We just made the design work for us. 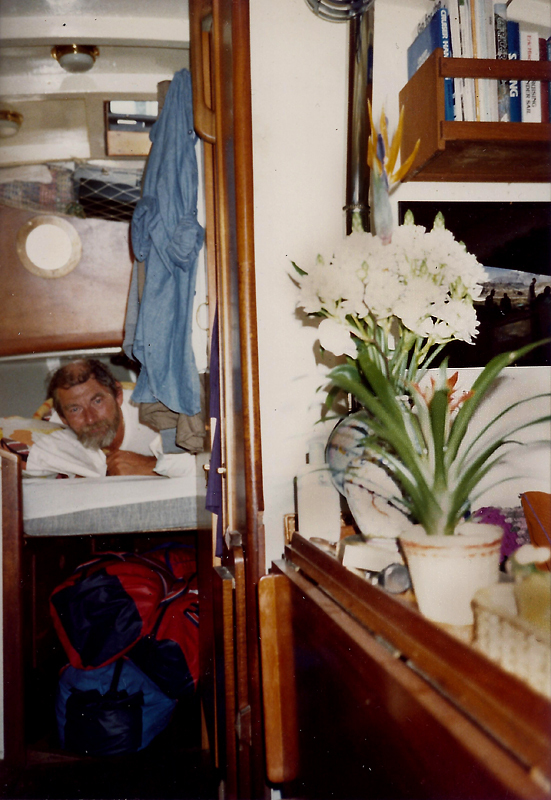 When we were living on Boat we talked and thought a lot about what People calls a Green House Boat or a Greenhouse Boat. Solar powered, live aboard “houseboat” capable of voyaging on canals, rivers lakes and coastal waters. At core a boat for the changing climate, sea level rise and all. We would have liked to build a prototype but the funds never came our way, and other solar and hybrid projects pushed the Greenhouse Boat aside. After a stay of 18 years ashore in South West France, we recently decided to go back on the water. Looking through lists of boats for sale suited to our advancing age - boats for canals, river boats and coastal boats - we found little that appealed and nothing, not even “projects”, that fit our likely budget once our house is sold. A tempest settled matters. 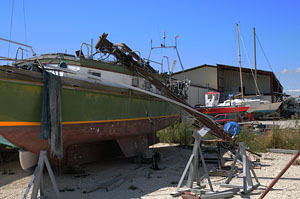 We hurried down to the Port Sur le Rive boatyard at Mortagne sur Gironde. We found that the neighbouring trimaran had been blown over. 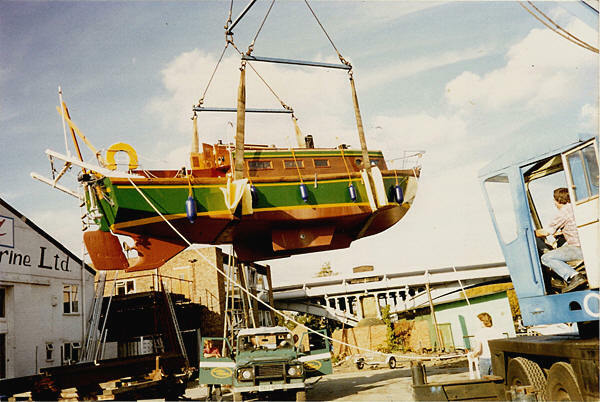 The multi-hull had settled across Boat, breaking her mast and boom in half, tearing the mast tabernacle out by the roots and leaving a gaping hole in her cabin top. 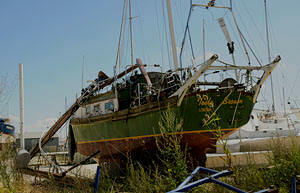 Even so, Boat seemed remarkably sound after so many years of embarrassing neglect. We could see just how and where to lengthen her. 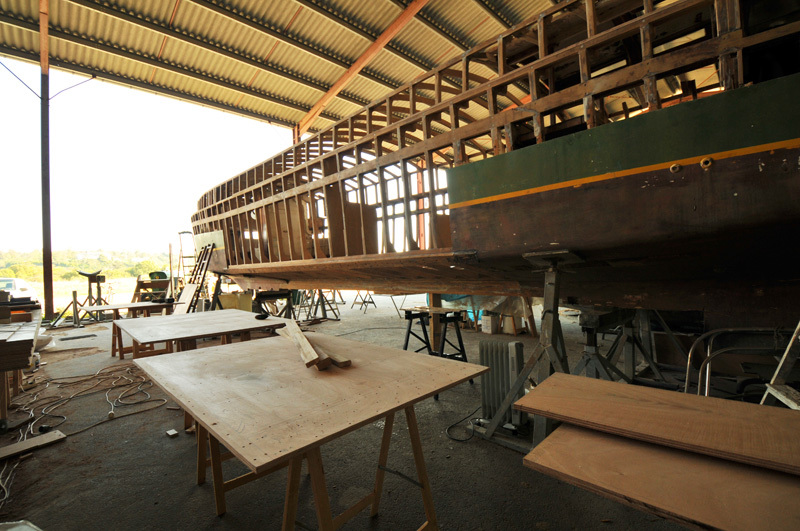 We could already imagine the new hybrid 14 metre sailing barge, we luxuriated in the new internal living space while relishing the idea of keeping the cockpit and foredeck as is, pretty much just renovating paintwork. It was decided, there and then. 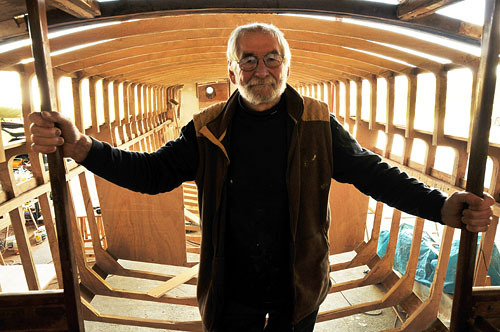 The LongBoat is a design exercise more than a renovation project. Everything is new or changed apart from the cockpit, which I already had completely re-created with extensive modification while in Fort Lauderdale in 1991. Outside, the cabin sides are radically altered so that we can walk along a narrow side deck while in locks or when mooring. By our standards (once was a 9.1m, 30 ft., boat) the cabin is now huge and long although no higher than before. Result is a longer, sleeker, more "bargey" look. Nothing wrong with that. Sailing barges were the workhorses of coastal as well as canal and, especially, river fleets before the advent of steam and diesel. 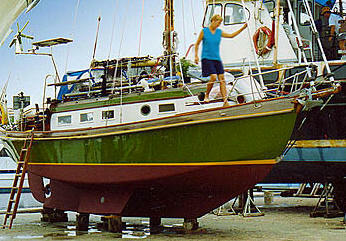 Underneath, the main ballast keel is unaltered. I had added a tonne onto it while in Florida. The new rig will be twin masted schooner, low profile, short masts 7-8m and long booms. 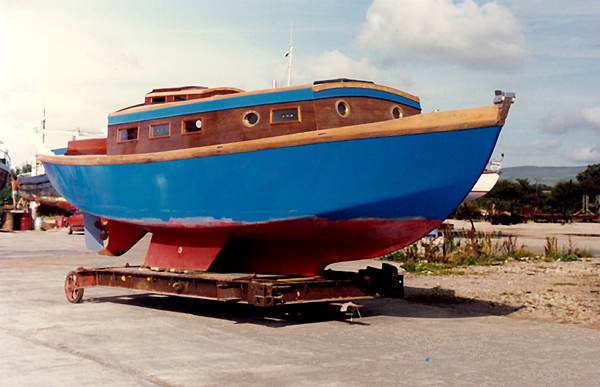 The old keel is enough for stability. The twin bilge keels are being extended by 50%. With a draft of only 1m the bilge keels are critical for directional stability, counteracting leeway, and for preventing the dreaded rhythmic rolling, and, when the tide goes out, to allow such a long boat to stand the ground without falling over or breaking her back! Inside, all is change, all is new apart from the old chart table and the essence of the galley which served us well and served up great meals for our friends for fifteen years. It is now possible to walk round most of the double bunk in the bow. The head or “vestiaire” and shower is 50% larger. The hanging wardrobe opposite 50% longer. I have my own office both sides of the companionway, with desk, computer, etc. on one side, three scanners and A3 printer on the other side for my photographic work. Moving on aft, People has an equal sized office to do in whatever People does. Magical things with websites, paints and pastels, ropes and threads and cloths. Continuing aft are the two settees, the banquette with our beloved fold out cabin table – glowing rich mahogany. As before, the companion way and cockpit steps separate the now more spacious navigation station, chart table and video screen from the extended galley. Internal goodies, apart from our working computer complexes and heating stoves, include stainless gimballed and fiddled two burner cooking stove with substantial oven. Good sized efficient fridge with freezer. Small but conventional washing machine and separate dryer. No dish washer or microwave. The first would be silly for mostly two people, and the second is tempting; could be used in a marina but impossible to power in the wild from our solar system. House power is similar to before, used to go a year without charging batteries. LongBoat will have two additional batteries making six 1 kilowatt hour 12 volt blocks and 400 watts of Solar power 20% efficient panels. Our old and usually reliable (except for one notable entire Atlantic crossing) 2-cylinder Volvo diesel engine would not be butch enough to push all 14m of LongBoat along with an occasionally required maximum of 8-9 knots. The maximum loaded displacement will now be about 10 tonnes. We need more drive. For the past 18 years we have been living in a farmhouse with five smaller houses on the grounds. The renovation and construction was seriously aided by using unique solar powered utility vehicles. Unfortunately there never was the where-withal to also install solar water heating and PV solar panels for power generation. We've always been deeply disappointed about this. Now we see a way of making amends. Those solar utility vehicles were all powered by Lynch pancake style high-efficiency traction motors. A quick call to our friends at LEMCO produced the answer. All dealt with in 10 minutes, the best things almost always are. They have a twin motor set-up with a reduction belt drive “gear” box which will give us oodles of torque, 50% more power than the Volvo and redundancy for safety – if a motor fails we can uncouple the belt and continue with reduced power on the other. Combining the Lynch motors with cheap (relative to Lithium) Sonnenschein gel batteries and Sunpower 20% panels we can have, for the price of installing a new diesel, a complete solar drive system. The power will come from 4 48v separate battery blocks. This will give us, on average, everything we need in terms of speed, daily range and get out of trouble performance. No need for back-up. Just a little careful battery management, no worse than ensuring you don’t run out of diesel. In the meantime I hope to post pictures which will illustrate each of the points made above. Preferably the visual will make the verbiage redundant and become a permanent record to my design. My degrees are not in naval architecture, but I have survived 3 hurricanes at sea (yes, we did check with the met office beforehand, but...), done a good few blue water miles, fought my way off lee shores and, basically, taught myself to sail with a little help from Bob Bond’s Handbook of Sailing and a lot of help from my Hawaiian Portuguese People.